The following is a transcript of the testimony I gave during my dedication to the music ministry. Just as I wanted to confirm my salvation to those present in the service, I also want you to have the opportunity to see how Christ has made a difference in my life. If you have not had the privilege of knowing Christ as your personal Savior, I invite you to contact me with any questions you might have. I would be more than happy to speak with you on this subject, as it is the most important decision you will ever make. I just wanted to start out saying that I love God and I thank Him for coming into my life. I guess a few weeks over 24 years ago, I was born to a wonderful set of Godly parents, and I couldn't ask for any better. I believe that [at] 2 weeks old or 2 days old I was in church. So, I've been right here from the beginning. I grew up coming to church, and pretty much every time the door was open, we were here. At the time, David Ray was the pastor. I remember he had been preaching a few messages in a row about Hell and Heaven and the differences between and that you had to make a choice between one or the other. One wednesday night on my way home from church, I was asking my parents some questions about salvation. That night, laying in my bed, I ask God to come into my life. That was January of 1988, when I was seven years old. I guess I could say that I've never really been the same since. When you're a little boy like that, things like [salvation], they're not as drastic in your life as when you've had experiences growing up. Nevertheless, I was still saved. I was attending Christian Heritage School, a private school. I had lots of christian friends and christian influences in my life. Then, it came to a point where I had to graduate from Christian Heritage. They only had through eighth grade, so I had to take a step into public school. So, I went to Southeast [Whitfield High School]. The first year was a little rough for me transitioning from a private school to public school. [It's] a lot different atmosphere. There's not quite as many christians in public schools as there is in private schools, so it was kind of hard to find some christian friends. So, I just kind of made friends with those that were around me, and they just happened to be non-christians. Instead of continuing to look for christian friends, I just kept those same non-christian friends. For those people that will tell you that your friends have an influence on your life, that's 100% accurate because I was hanging out with people that didn't really care about God and didn't care about His will for my life, much less me. I began to let my non-christian friends have an influence on my life. As high school went on, I just kept slipping further and further away from God. Then, I went to college after I graduated, and I just kept getting worse. Satan had a strong grip on my life. But, thanks to me beginning to make christian friends here at [Temple Baptist] Church, I realized that what I was doing, it wasn't right. A few years ago we started doing Judgement House. That first year, man, it really impacted me. Even though we didn't see that many people saved, I saw what the church could do when we pulled together and did something in God's will, because I believe that was truly what God had in store for this church. From that point on, I think it was around that time that, our church, as a whole, started getting closer to God. As some of you can recall, that next year we had kind of a disagreement as far as Judgement House, and there was a lot of hard feelings going. You could feel it. There wasn't a cohesiveness, I guess, between the Judgement House committee. But, when we all prayed and asked God to guide our lives and what He had in store for us, everything pulled together. And, that year we saw a drastic change in the number of salvations and rededications. And, the church as a whole just began to get closer to God, including myself. Then we, this year...well, let me back up. About a year ago, God started working in my life, speaking to me about some things that maybe He had in store for me. So, when we went into the 40 Days of Purpose at the first of this year, I went into it wholeheartedly looking to find what God had for my life. I remember the first night of the 40 Days of Purpose class (the group studies) Debbie, who was our leader, went around the room and asked us what people we would like to influence in our life. We went around the room and people were naming family members and friends. And, when she got to me, I said "I'd like to influence the world." And she said, "No, really, who would you like to influence?" And I said, "I'd really like to influence the world!" I don't remember if it was 'influence' or 'have an impact' or something of that nature, but that was what God had put in my heart, that I was going to impact the world. Through that study, God really began to speak to me about several things, one of which, I guess my dad went through the same thing, because he preached about it this morning, simplifying our lives so that we can focus on what God has for us and not what we want for our lives. So, 40 Days of Purpose was over, and we started the new sunday school book that, to me, just kind of flowed right along. God, I guess He had told me what He wanted me to do, but I waited for a little while. God had been working on me for a while about what He wanted me to do. About, I guess it was the first of this summer, I finally submitted. God called me to be a singer and a songwriter. I know you're thinking, "I know what he's gonna say, he was called to preach!" But, that's not God's will is for my life. Alot of people had told me that that's what I should be. But, I did make a pact with God. Alot of people, anybody, can write songs and sing them, but not everybody has that calling on their life. So, I made a pact with God that, if I did this, no matter where I sang or played, I would take a section of that time and present the gospel. I guess, in a way, you could say I accepted the call to preach, too. But, to me, we've all been called to preach. God said to go out into the world and preach the gospel. So, we're all called to preach. That was the calling that I accepted on my life. So, I began to say, "Well, what do I need to do this? I need a guitar. I need a really nice guitar that I can use for this ministry." So, I began to look around and found the one I wanted. Then, it came to where did I want to buy it from. Somebody had told me of a place that had the best deals. So, I went there and talked to the guy for a little while. He would cuss every other sentence, and I didn't really feel comfortable buying from that guy. But, God began to speak to me and said, "It's not what you want, it's what I want." He said, "I want you to buy this guitar from that guy, because when you come back to pick it up, you're going to witness to him." So, I ordered the guitar from him. While my parents were gone on vacation [last week], I had asked the church to pray for me [about witnessing to this guy]. This Tuesday, he called and said my guitar was in. Immediately, Satan began to work against what God had called me to do, and that was to go witness to that guy. Every day this week we had something go wrong at work and there was somebody having to work over every day. Usually, I can get my work done during the day and I have some free time. That's actually when I ordered the guitar, on company time. But, our boss doesn't care, so I am clear on that. So, I thought, "Well, one day this week while I've got some free time, I'll go and pick it up." But, like I said, every day something was going wrong, and I knew that Satan was trying to me keep me from talking to him. So, it ended up we still had some stuff going on Friday and the boss asked us who all wanted to work. I had called the guy and asked him if he was going to be open Saturday, and he said, "Yeah." So, I told the boss, I said "I'll work." That would be the last chance this week I would get to talk to him. We ended up not having to work a full day, and as soon as I got off work, I went up there to talk to him and pick up the guitar. I was sharing with Marty [Cooper, Minister of Evangelism] that alot of people that I witness to, well, pretty much everybody (I know this is an excuse alot of times to get me off their backs), but they say "Yeah, I'm saved. I was saved when I was younger" or just "I've been saved." But, I had asked him if he was saved. Well, I asked him if he went to church. He said "Yeah," and he told me where he went to church. Then, I asked him if he was saved, and he said "Yeah, I was saved. But, it was when I was a boy." Throughout this whole conversation, that phone was ringing off the hook. This is a little small music shop which really shouldn't be getting that many phone calls. But, that phone was ringing off the hook. I could get about one or two sentences in before he would have to answer the phone. He told me that he went to church, and I asked him if he went regular. He said, "Well, I try to," which, to me, said "No I don't." So, I talked to him a little bit more, and he stuck by the fact that he was saved when he was a little boy, and that's fine. But, I still feel in my heart that he's just using that as an excuse. But, it's not over. He asked me to come in again before Christmas time so he could look at the guitar and make sure it was alright, so I'll have another chance to talk to him before the end of the year. If I want to, I guess I could just say, "Here, I need you to check out this guitar," and I can go talk to him whenever. Well, let me show you the guitar. This is the the guitar that God is going to use, through me, to share in my ministry. When I picked it up Saturday, the first thing God said was, "You don't need to do a thing with that guitar until you have my blessing." So, Saturday night, last night, I showed my parents the guitar and said, "I don't want to do anything with this guitar until I'm anointed by God, and this guitar, as well." So, I've asked that Dad would just kind of anoint me and dedicate this guitar and my entire ministry to the gospel, and to sharing what God has put in me. I would ask that you pray for me as I take this new endeavor. God's put alot of things in place that's just making everything just kind of fall right into what He has for me. I've got a place to record, and alot of things are just falling into place. But, just keep me in your prayers and I will keep you guys in my prayers. I guess you can take it from here. Immediately following my testimony and the announcement of my call to the music ministry, my dad, Pastor Bret Yaeger, called all those present to come and lay hands on me to show their support for God's calling on my life. 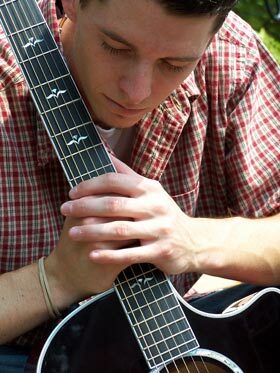 He anointed both me and my guitar with oil and dedicated us to the ministry. This is something that has been done since the days of the Bible and signifies submission to God's will. I don't know exactly what God has in store for me in the future, but I know I'll never have to worry about how things will turn out. He is in control of my life, and that's all I need to know.